Alice Klauber (1871-1951) was chairperson in charge of the 1915 Panama-California Exposition’s art department. 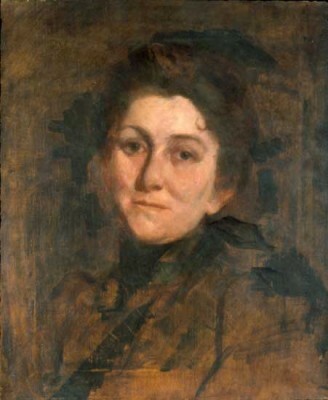 In 1907 she had studied with artist Robert Henri in Spain. She convinced him to visit San Diego in 1914 where Henri, with Klauber and Edgar Lee Hewett, director of exhibits, arranged for an exhibit of American impressionists and artists of the “Ash Can School” at the Exposition’s Fine Arts gallery. The exhibit included work by some of America’s foremost contemporary artists. Among those who exhibited were George Luks, Maurice Prendergast, William Glackens, John Sloan; Childe Hassam, George Bellows, and Henri. This was the first time San Diego had been exposed to a major exhibition of contemporary American art, but San Diegans and Exposition visitors paid little attention. Exposition directors were reluctant to allow women representation in the direction of the Exposition. This obstinacy led Miss Alice Klauber to form the San Diego County Women’s Association and to notify the board that if provision were not made for women during 1915, the association would advertise the fact in every women’s club in the United States. Not surprisingly, the board came around. San Diego women wanted to provide restrooms and comfort facilities for women and children, to protect single women from the perils of the city and to entertain Exposition visitors. These concerns led to the development of several women-oriented rooms on the Exposition grounds. …adapted from Balboa Park and the 1915 Exposition by Richard W. Amero.